Description Of Item: Rub-a-dub-dub, it?s time to get in the tub! With soaps, lotions and other bath-time potions, these pets are ready to dive in and come out squeaky clean! 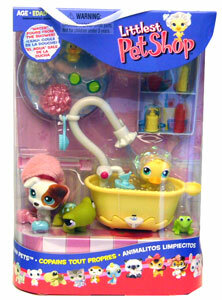 This tub-time playset comes with everything you need to get your pets looking their best! Slide the button and ?water? pours from the shower! Three exclusive pets come with lots of fun accessories.